We recently conducted a survey to discover Britons average fridge contents. 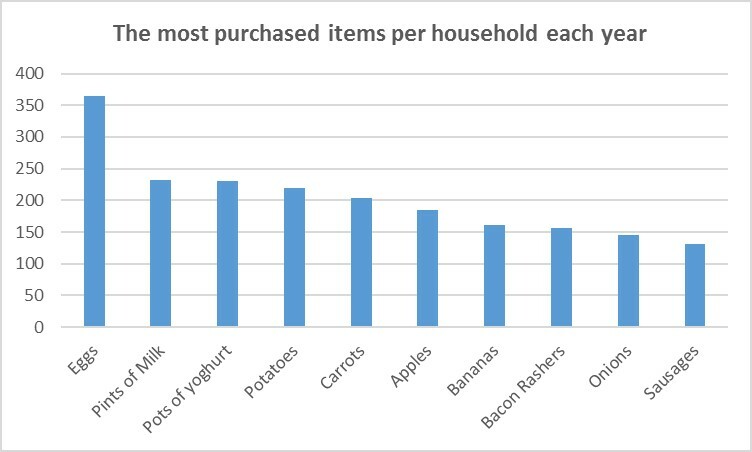 The survey asked 1000 Brits to detail the items that could be regularly found in their fridge and discovered that the average household buys 365 eggs a year, 231 pints of milk, 157 rashers of bacon and 55 loaves of bread, amongst other things. 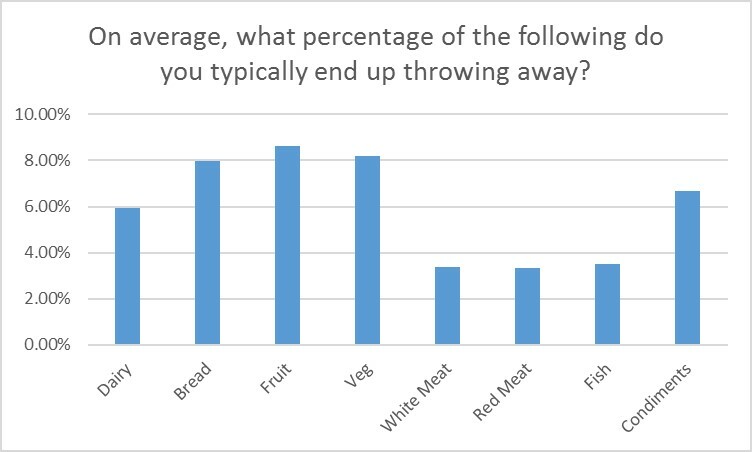 We also asked people to estimate their food waste and revealed that British households throw away an estimated 6% of their weekly shop. This 6% of food wasted equates to £2.56 of their £43.14 average weekly shop, or £133.12 a year. The most commonly thrown away items were those that quickly go bad such as fruit, vegetables and bread, with almost 10% of these items being discarded. That equates to 18 potatoes, 16 carrots, 15 apples, 13 bananas and 4 loaves of bread being wasted each year. 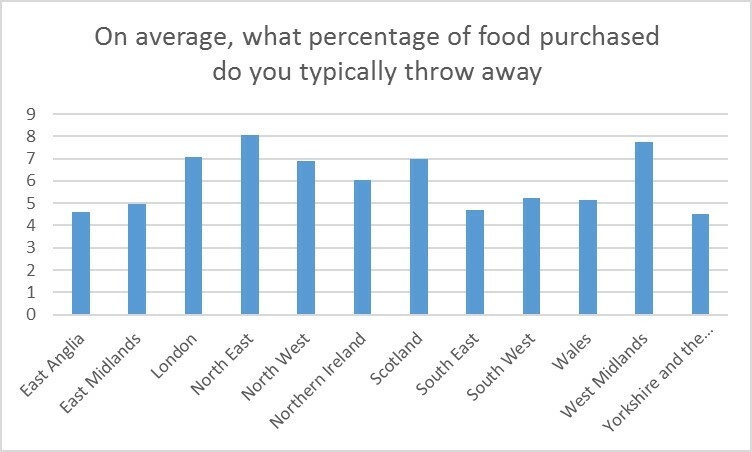 People in the North East spend the least on their weekly shop – a frugal £36.45, however they also admitted to throwing away the most, an average of 8% of their total shop or £151.63 a year. 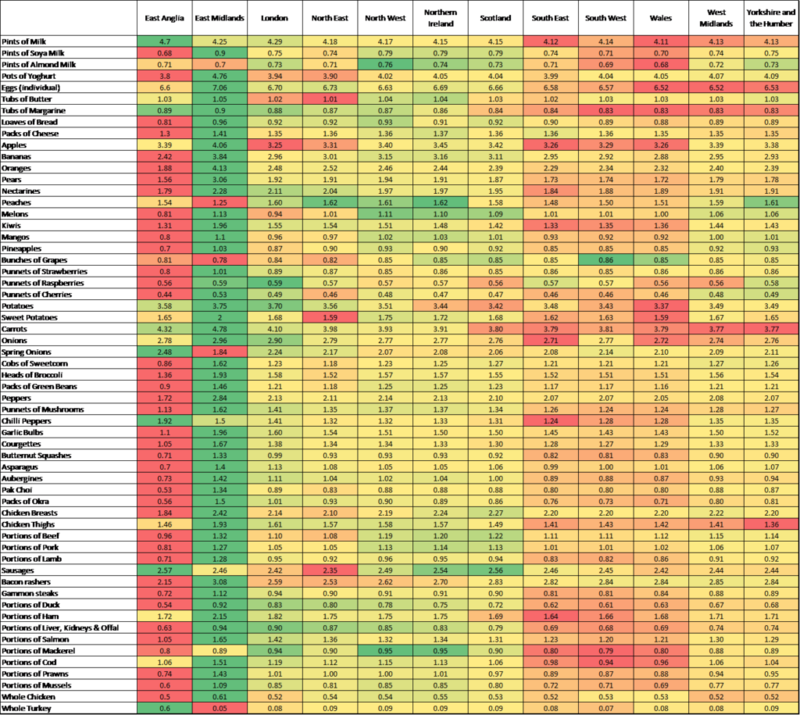 It was also revealed that East Anglians purchased the least with only 87 items each week, however they bought more milk, sausages, spring onion, chilli peppers and turkey than any other county. In April, The Trussell Trust revealed that they had provided 1,109,309 emergency food supplies in the 2015/16 financial year, with over 400,000 of these going to children. Charity FoodCycle, which runs community projects across the UK working to help reduce food poverty, said food waste not only has an impact on your pocket but on the environment too.